It can be a very tortuous existence for engine bearings. Think about it. Bearings are there to be abused and many engine builders treat them as a consumable. Most of the attention bearings receive is heaped upon design, clearances, and oil feed theory. But once the engine is broken-in and running, attention shifts to other concerns. This story looks at how bearings, coatings, and the oil you choose can have a dramatic effect on bearing life. As you might expect, this means spending a little more money up front, but the results may make that an easy decision. The engineers at King Bearings — headed by Dr. Dmitri Kopeliovich, a leading expert in design, technology and materials for engine bearings — have recently developed a new performance rod and main bearing called the pMaxBlack. This is a bearing with major changes to the tri-metal alloy, in a quest to create a material that is still soft enough to handle a high-output engine, while simultaneously offering increased fatigue resistance and load carrying capacity. The inside story on how King developed this bearing is steeped in alloy-metal technology, so let’s just say they figured out a way to make a bearing stronger to withstand the abuse from increased power levels while still making it soft enough to properly do its job. Race or performance oriented tri-metal bearings are built intentionally soft because, if a rod journal deflects or a crankshaft bends under high load, the journal may contact the bearing. If the bearing is soft enough, it merely wears slightly. Unfortunately, cold startups tend to take their toll on engine bearings, since the crank rotates for several revolutions before the film of oil builds up between the bearing and the journal. This is why you often see race teams pressure lube the engine each time before cold startup. The King pMaxBlack performance bearing isn’t a coating but rather a new bearing top overlay that increases hardness by 24-percent yet with 17-percent greater fatigue resistance. Adding the pMax Kote coating makes these bearings even more wear-resistant. “The advantage of the HP bearing is that it will tolerate handling debris and crankshaft deflection better than the XP or XPC because of the 0.012-inch thickness of the aluminum layer.” The babbit overlay on the XP bearing is only 0.0005-inch thick. This thinner layer does not tolerate debris and crankshaft deflection as well. Today’s 21st-century street engines are now making more horsepower than pure competition engines from as little as two decades ago. Builders naturally expect the bearings to keep up with these enhanced power plateaus. This is why King Bearings developed the pMax Black bearings. Taking this idea a step further, King developed a coating for this bearing called pMaxKote. This becomes the ultimate-performance King bearing, employing what the company calls a nano-composite polymer coating. According to Sledge, the term nano-composite just means it is made up of nanosized materials in a polymer base. The coating is added on top of the pMaxBlack overlay and does not increase the thickness of the overall bearing wall. To maintain the same dimensions, King compensates with the thickness of the intermediate copper layer to allow for the 0.0002-inch thickness of the pMaxBlack coating. This allows for maintaining the same oil clearances as uncoated counterparts. The coating protects the bearing from mild abuse and is designed to be extremely wear resistant – even when slight contact is made with the crankshaft. This is what happens when a connecting rod bearing runs for a short time at max load with insufficient lubrication. 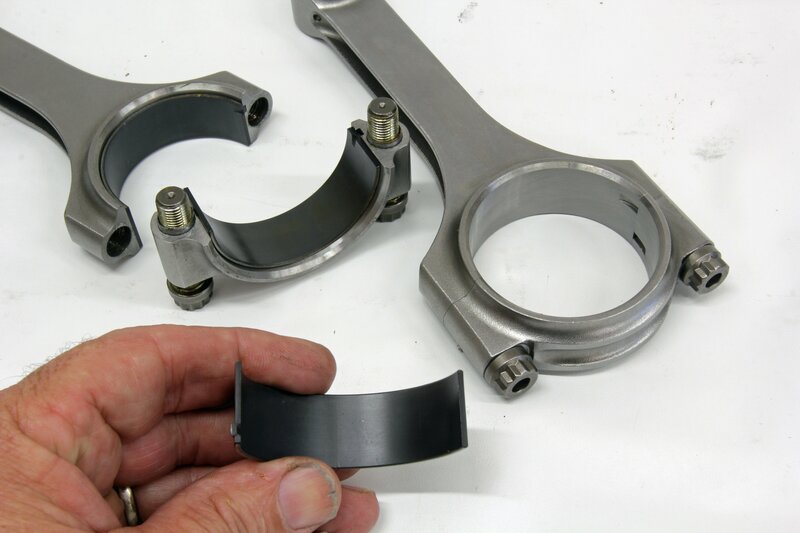 Connecting rod bearings often fail first because they are heavily loaded and are last in line for lubrication. All of this sounds really good, but the question becomes, how would this coating work in the real world of internal combustion engines? 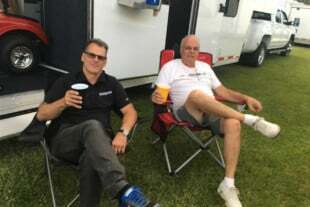 King thought that an independent test would be a good idea, so they collaborated with Lake Speed, Jr. at Driven Racing Oils, and the team at Shaver Specialties, where they set up an abusive test schedule. The plan took shape by placing a relatively mild 440 hp, 383ci small-block Chevy on the dyno. They used a purposely excessive cylinder test regime that would heap serious load on the connecting rod and main bearings and then evaluate the results. This required a baseline or control combination, with a couple sets of King XP, Tri-metal bearings, and Driven supplied a mineral-based, 5W-20 as the baseline lubricant. To make this a true lubricant comparison, the engine oil additive packages had to be exactly the same. Because there were no off-the-shelf mineral-based and synthetics with the same exact additive package, Speed supplied both custom-blended oils for the test. This is an example SPEEDiagnostix report sheet from this test. It shows the type of results you can expect as part of the evaluation. Any warning signs are immediately highlighted in yellow or red. If everything is good, the check marks are in green. Neither is available as an off-the-shelf oil with this specific blend of additives, but they both are representative of high-zinc and high-phosphorus lubricants. Speed chose a lower viscosity base-oil which would intentionally decrease the oil film thickness and increase potential bearing contact and wear. As you can see from the results chart, the differences are measured in as little as single-digit parts-per-million (ppm) numbers. In order to ensure these numbers are accurate, Speed also performed a flush procedure between each of the four tests. This involves draining the test oil, removing the Wix oil filter, and refilling with Driven’s break-in oil BR30 along with a new filter, and then running the engine for 30 minutes, including two full-power dyno runs. Then the break-in oil is drained and the filter removed and the next oil is added. This exact same procedure is repeated when the bearings are changed. This ensures that the results will be as accurate as possible. This photo shows the uncoated XP rod bearing on the right after running loaded for over three hours using a 5w20 conventional oil. The same test with the same oil was performed on the King pMaxBlack XP bearing on the left. The wear reduction is obvious. The accompanying results chart also lists the additive package. Zinc and phosphorus (ZDDP) are anti-wear additives that most enthusiasts are familiar with. Molybdenum and boron are friction-reducing additives while calcium is employed as a detergent. These were the main additive package ingredients for both the conventional and the synthetic oils so that the only difference was the base oil. After the first test sequence with the petroleum-based oil, Shavers’ engine builder, Keith Chrisco, removed the first set of bearings and added a second set of identical XP bearings. 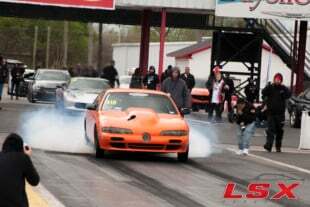 He then ran the engine using the mPAO-based synthetic 5w20 oil. The third test involved switching to a new set of King’s pMaxKote rod and main bearings, but returning to the traditional mineral base 5w20 oil. The fourth and final test saw the installation of another new set of pMaxKote bearings run this time with the synthetic oil. This created a comparison of coated and non-coated bearings with traditional and synthetic engine oil. These are five of the lower, uncoated XP bearings as they were pulled directly from the engine after running the test using conventional oil. As you can see, there is considerable wear. The evaluation criterion for each test would be a comparison of the wear count of the different metals (in ppm) by analyzing the oil drained from each test. The testing was performed by SPEEDiagnostix, a new oil evaluation company using the same metal spectrometer techniques as is used in current Formula 1 racing. The best way to really load these bearings and ensure that the test schedule would be both consistent and survivable was to pull the aforementioned small-block Chevy down to an extremely low RPM with a high load. The SuperFlow dyno was able to pull this little Chevy down to 1,450 rpm for a total of three hours and fifteen minutes for each of the four tests. During this time, the low-RPM test was interrupted so the engine could also be subjected to a complete test up to just past peak horsepower a total of 14 times. Oil and water temperature was also closely monitored. Instead of horsepower, this test was all about survivability. In the attached chart, we have condensed a much more expansive report down to the wear results. The important wear materials are iron, copper, lead, tin, and aluminum. Both the standard and coated King tri-metal bearings are made up mainly of copper, tin, and lead so these would be the major elements that would indicate bearing wear. Aluminum would originate mainly from the pistons while the iron would likely be sourced from the cylinder walls. While the trace material numbers are relatively low PPM counts, it is the differences from each test that is compelling. Let’s start by explaining each category in the results sheet. The Oil Type indicates the type of oil – either conventional or synthetic. The Bearing Type indicates whether the bearings were coated or uncoated. The Oil Viscosity Index is a rating system applied to engine oil that indicates how much an oil viscosity changes over a wide temperature range. The higher the number, the more thermally stable the oil is over a wide range of temperature. This means that as the oil warms up, it loses less viscosity. This bearing and oil test demanded the engine be subjected to multiple tear-downs to replace all the bearings but the results were well worth the effort. Shavers’ small-block has been torn down so many times it should have zippers. To save time, Chrisco changed the main bearings without pulling the crank. He loosened all the main caps and carefully removed the old bearings and installed the new ones by pushing the bearing while turning the crank. Also note, that we’ve listed each additive component in ppm. This is important because this clearly shows that the additive packages for both the conventional and the synthetic oils were identical. So this means that any reduction in wear materials (when comparing oil) must be attributed to the quality of the base oil and not to the additive package. Now that we’ve got that handled, the results indicate that the combination of King Bearings’ MaxKote bearing with an mPAO synthetic base oil is an excellent way to drastically reduce wear in an engine. As you can see, the baseline total wear number of 35 ppm (created simply by adding up the wear numbers of each individual element) using a conventional bearing and a mineral-based oil, was reduced 74-percent by using a high-quality mPAO synthetic like that from Driven Racing Oil, combined with the pMaxKote bearings. Just changing to the coated bearings while retaining the conventional oil also produced a significant improvement, reducing the overall total wear count from 36 to 21 ppm, which is a 40-percent improvement in wear. This reveals the significant increase in durability from the coating itself. 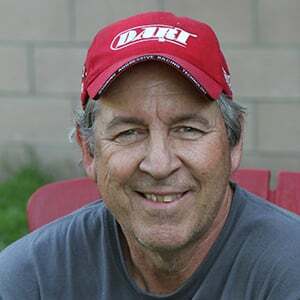 This is especially important when you get into a cost-performance ratio because the coated King bearings are more expensive compared to non-coated rod bearings for a small-block Chevy. You will note in the results a somewhat higher-than-anticipated lead wear metal reading in the third test with an uncoated bearing and the synthetic base oil. The lead is the dominant metal found in a tri-metal bearing overlay (lead babbit), so wear was slightly higher in this case compared to the conventional oil. While every attempt was made to keep the testing as standardized as possible, there are any number of variables that could account for this higher number. While the lead numbers were higher than any other test, the total wear metal count was still lower than uncoated bearings with conventional oil. Shavers’ 383ci small-block Chevy has been horribly abused over dozens of dyno tests over several years and is still going strong. While the synthetic oil used in this test was a custom blend to standardize the additive packages, Speed said that a Driven oil that would be comparable to the mPAO synthetic used in this test would be Driven’s XP line of race oils. These are available in several different viscosities based on how the engine would be used, ranging from a 0W to a 15w-50. This oil is more expensive, but when you consider the expense involved with rebuilding an engine, the cost is easily justified, because the oil will last so much longer with lower wear metal contamination. Engine wear isn’t something that most hot rodders stress over, but with the sizable investment that most engines demand, perhaps it is a subject that should be given its fair share of attention.